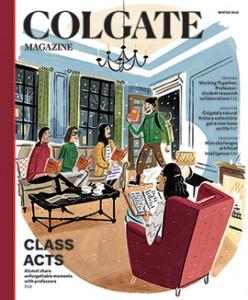 Colgate teaches its students to identify objectives, develop a plan, and work diligently to achieve success. The university followed its own advice when it built Benton Hall. Opened in August 2018, Benton Hall fulfills Colgate’s ambition to house career services, Thought Into Action, and Office of National Fellowships and Scholarships under one roof — and it declares the university’s commitment to success after graduation. The Career Services office, which sees more than 10,000 individual appointments each year, will be able to use this new space to better facilitate internship and full-time employment opportunities for both current students and alumni. The Office of National Fellowships and Scholarships helps students and alumni apply to competitive fellowships and to gain readiness for applying. Fellowships are available to all class years as well as alumni. Colgate’s Thought Into Action program, which promotes entrepreneurship and student-alumni engagement by connecting entrepreneurs with resources and direct mentorship, has supported more than 340 ventures in its 10-year existence. 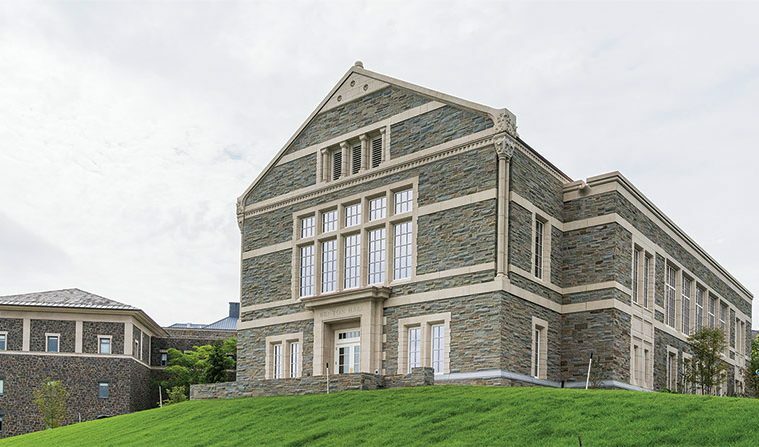 Reflecting Colgate’s commitment to sustainability and achieving a carbon neutral campus by 2019, Benton Hall is aiming to become LEED Platinum certified. Materials in the project are made of recycled materials and sourced from within 500 miles of the site, including blue stone from Ithaca. Construction of the building began in February of 2017 and ended in August 2018, just in time for the start of the Bicentennial celebrations. The $16.2 million cost was fully donor funded. Like many buildings across campus, Benton Hall’s exterior incorporates Romanesque style. As the new hub for career discovery, the building has an interview suite and five tech-integrated interview rooms, the Clifford Commons and Rosensweig Seminar Room for larger meetings and teaching space, 10 spaces with video conferencing capabilities, and administrative offices. The construction of Benton Hall is a part of Colgate’s larger $60 million building campaign to enhance the student experience. During construction, a time capsule was placed in the exterior facade at the south entrance of the building. The 18,500 square-foot building was designed by Robert A.M. Stern Architects, one of the world’s leading academic architectural design companies.